Author Mike Chinn brings the adventure and emotion of Classic Pulp to new life in Damian Paladin, a character reminiscent of multiple heroes who once fonud their home in Pulp magazines. Thanks to Pro Se Productions, Paladin shoots and fights his way into New Pulp in a new collection of stories from Chinn-WALKERS IN SHADOW. Demons in Manhattan sewers. Enchanted gateways deep within the Bowery. Zombies in Harlem. Old World vampires haunting New Rochelle. Hidden Templar treasures and a hunt for the Grail across the length of a continent. 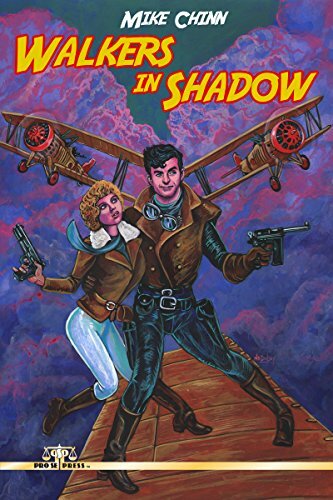 Quasi-immortal Damian Paladin and adventuress Leigh Oswin pit their wits, guns and flying skills against the magical and mundane in 1930s America – and worlds beyond. Thrill to Author Mike Chinn’s WALKERS IN SHADOW from Pro Se Productions. With an exciting cover by Larry Nadolsky and logo design and print formatting by Marzia Marina and Antonino Lo Iacono, WALKERS IN SHADOW is available now at Amazon at https://www.amazon.com/Walkers-Shadow-Mike-Chinn/dp/1546353410/ref=sr_1_3_twi_pap_2?ie=UTF8&qid=1493953738&sr=8-3&keywords=Walkers+in+Shadow and Pro Se’s own store at www.prose-press.com for 15.00. The Damian Paladin collection is also available as an Ebook, designed and formatted by Marina and Lo Iacono for only $2.99 for the Kindle at https://www.amazon.com/Walkers-Shadow-Mike-Chinn-ebook/dp/B072BHV9XL/ref=tmm_kin_swatch_0?_encoding=UTF8&qid=1493953738&sr=8-3 and for most digital formats via Smashwords at https://www.smashwords.com/books/view/722252. PULP MAGIC YOU CAN HEAR! THE NEW ADVENTURES OF DIAMONDSTONE THE MAGICIAN NOW ON AUDIO!